On October 14-15, 2017, Americares celebrated its 30th Anniversary Airlift Benefit with a gala dinner and 24-hour visit to Guatemala. Due to the generous sponsorship of the Rucci Law Group, LLC, I had the distinct honor of participating in this year’s trip. The Airlift Benefit chooses one region annually to provide donors a first-hand view into the herculean efforts behind their day-to-day service. Americares’ presence has increased dramatically over these thirty years of delivering aid to the underserved and providing disaster relief both at home and abroad. The night was filled with awe-inspiring tales from the people most affected. The mood was festive and humbling as it crossed political lines and touched the humanitarian spirit in us all. A special award, The Bob Macauley Spirit of Humanity Award, was presented to President George H.W. Bush and his wife Barbara, who have long championed and promoted the Americares mission. 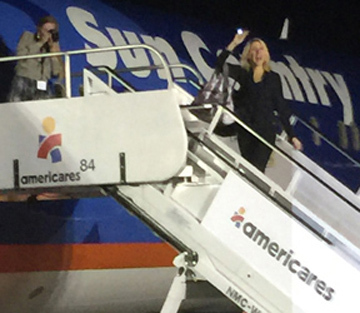 My whirlwind trip began as I left the party and boarded the Airlift flight joined by 100 other donors, partners, and Americares leaders. While in Guatemala, the groups visited several sites, where we assisted Americares in delivering much needed items and medical supplies. To mark the 30th anniversary, Americares partnered with the Foundation of Hospital Art, allowing us to participate in an interactive art project with the residents of the institutions receiving aid. We worked with children, teens, adults and seniors suffering from severe physical disabilities. My journey took me to “The Social Work Association of Brother Pedro in Antigua,” where I had the good fortune of meeting incredibly dedicated volunteers serving the neediest Guatemalans. We witnessed the support of the San Pedro monks and other workers who assisted children and adults with chronic malnutrition, cerebral paralysis, and physiological and physical disabilities, all of whom had either been abandoned or left uncovered by the national health system. Our last stop was atop a mountain where the men and women of the Order of Malta hosted a special lunch, complete with steel band and an artisan market. The joy and appreciation evidenced by these locals was heart-warming, leaving one with a glimmer of hope. Guatemala’s needs are dire: the country is overwhelmed by poverty and sickness. Americares addresses the needs not only of the people of Central America, but also those of another 164 countries across the globe, including the United States. It is reassuring to know that such a dynamic organization exists to shine even the tiniest light on this humanitarian crisis by providing good will and hope for the future.